Day 7 – Simon zuvorderst dabei! Nachdem Simon das Gate vor Lanzarote an zweiter Stelle gerundet hatte, wählte er eine Route nördlich von Gran Canaria und Teneriffa; anders wie der Leader Aymeric Belloir (FRA). Er meldete den Race Committee kurz nach dem Passieren des Gates, dass er in den Mast steigen muss um seine Windmessanlage zu reparieren. Seine Original-Windmessanlage hatte er bei der Überführung von Gijon (ESP) nach Sada (ESP) vor dem Start verloren. Die letzten zwei Tage vor dem Start in Sada nutze er um eine Masthalterung zu laminieren für seine Ersatzwindmessanlage; anscheinen gab es trotzdem ein Problem. Genaue Windinformationen sind enorm wichtig, damit der Autopilot korrekt nach einem Winkel zum Wind steuern kann und das Boot schnell unterwegs ist. Simon hat durch seine Bastelei am Mast einige Meilen auf Justine Mettraux (SUI) und Aymeric Belloir (FRA) eingebüsst, was er jedoch mit einer guten Taktik und Bootsgeschwindigkeit sehr wohl wieder gutmachen kann – das Rennen ist noch lang! Simon hat nun eine etwas südlichere Route gewählt und liegt noch immer auf dem dritten Platz! Die Statistik beweist wie schnell Simi noch immer unterwegs ist! Go Simi!!! Après que Simon avait passé le gate devant Lanzarote en deuxième position il a choisi une route plus au nord de Grand Canaria et Tenerife que le leader Aymeric Belloir (FRA). Il avait informé le Race Comittee à la passage de bouée qu’il va devoir monter au mât pour réparer son aérien. Il avait perdu son aérien original pendant le convoyage de Gijon (ESP) à Sada (ESP) avant le start. Les deux derniers jours avant le départ il avait laminé une fixation pour son aérien de réserve; apparemment il y avait quand même des problèmes. Des informations de vent précis sont extrêmement important pour que le pilote puisse suivre un angle du vent et faire marcher le bateau à bonne vitesse. Pendant le bricolage au mât Simon a perdu quelques miles sur ses concurrents directs Justine Mettraux (SUI) et Aymeric Belloir (FRA). Avec une bonne tactique et une bonne vitesse Simon ne va avoir aucune problème de reprendre cette distance – la minitransat 2013 et enocre longue…. Simon a choisi une route un peu plus au sud et se trouve toujours en troisème position! Aussi la statistique preuve qu’il avance très vite! Go Simi!! After passing the gate in front of Lanzarote on second position, Simon chose to pass the islands of Gran Canaria and Teneriffa on the north, not as the leader Aymeric Belloir (FRA) who passed in the south. He informed the Race Committee, that he has to go up the mast to repair his wind instruments. On the delivery from Gijon (ESP) to Sada (ESP) he lost his original wind instruments and had to fix it during the last two days before the start – apparently he nevertheless had some troubles with the repair. It is extremly important to have precise wind information so that the auto pilote can follow a particular angle to the wind and sail the boat fast. During the repair work at the top of the mast Simon got some miles behind his direct rivals Justine Mettraux (SUI) and Aymeric Belloir (FRA). But with a good tactics and boatspeed, there is no problem to catch up – it’s still a long way to Guadeloupe. 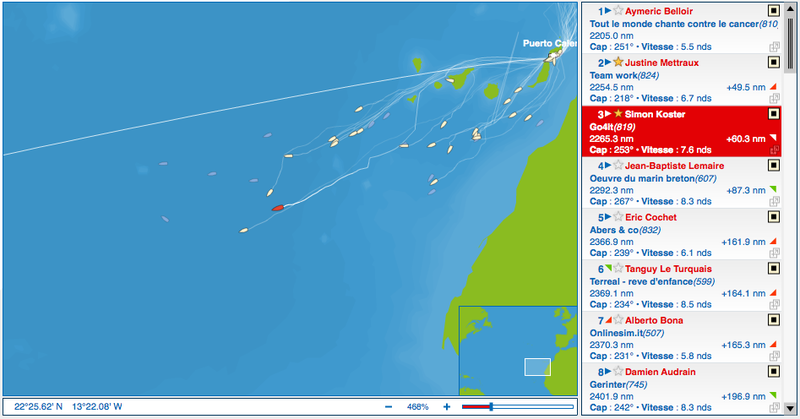 Simon is now sailing a little more south than the others and he is still on third position. A look on the statistics shows that he is still pretty pretty fast!! Go Simi!!! This entry was posted on November 20, 2013 by simonkoster. It was filed under Uncategorized .